BOSTON—Was it past and future? Or past and past? Or future and future? It could any of these or perhaps none. 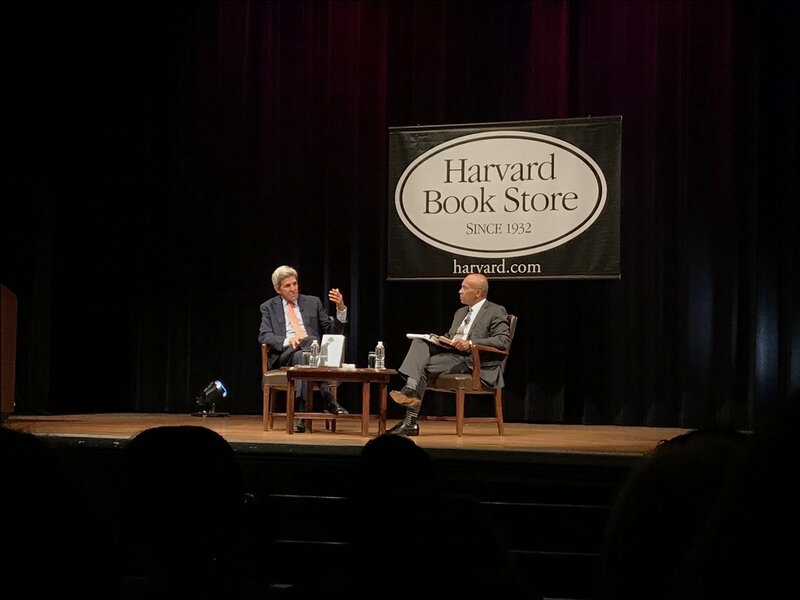 On September 7, former Secretary of State—and US Senator—John Kerry discussed his new book in an interview conducted by former Governor Deval Patrick. Kerry’s memoir, Everyday is Extra, and the talk itself come as both men have been floated, to varying degrees of seriousness, as presidential candidates in 2020. 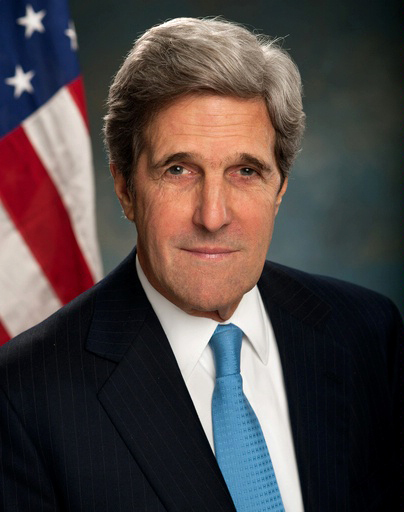 Kerry was his party’s nominee in 2004 and returned the Senate after failing to defeat George W. Bush. He served nearly 28 years as Massachusetts’s US Senator. 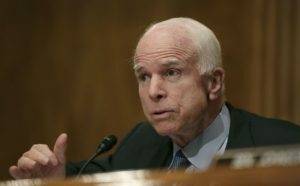 Before that he had become a noted anti-war activist, disillusioned with the conflict in Vietnam in which he had served. Kerry’s tenure of former president Barack Obama’s second secretary of state has appeared to be his career-capper. “Congratulation on a long, brilliant life of service to the nation and to the world,” Patrick said to Kerry. On the surface, the Harvard Book Store-sponsored talk had no electoral dimensions. However, politics were unavoidable as Kerry discussed his life in public service. The near-capacity Back Bay Events Center erupted in cheers as Kerry—and, sometimes, his interlocutor Patrick—offered words of hope. “We have the opportunity to have the most important course correction in our nation’s history.” Kerry said, of the upcoming elections. Despite some chatter, few think the 74 year-old ex-diplomat is running in 2020. After all, he’s been there before. Yet, his experience in politics and life generally—Kerry likened his life’s intersections with US history to Forrest Gump’s, including a Tom Hanks cameo—could inform would-be 2020 aspirants. By this time next year, a flotilla of Democrats could be running for president. Among them, may be Patrick himself. Patrick has been urged to run by prominent advisers to former President Barack Obama. Much of the former governor’s kitchen cabinet from 2006 had been working on other campaigns. 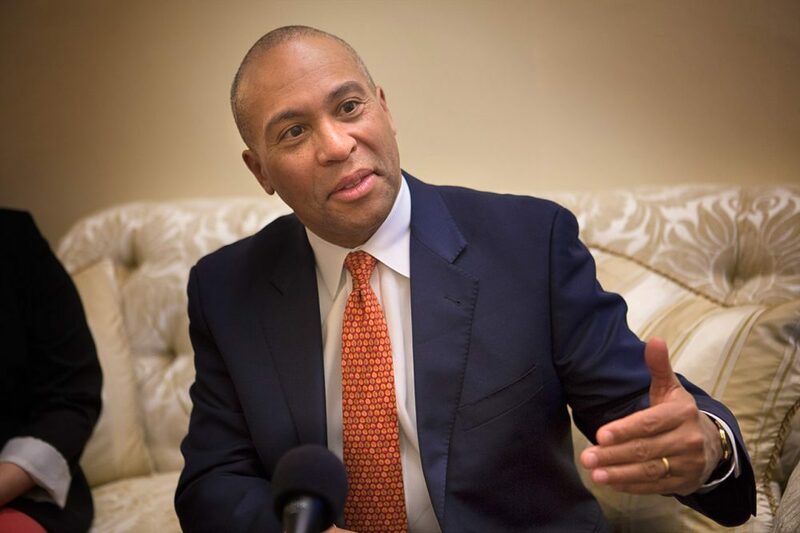 Following the Massachusetts primary those have largely concluded and buzz around Patrick has grown. The former governor had eschewed the spotlight since leaving office. He has begun to resurface lately, campaigning for now-Alabama Senator Doug Jones and, increasingly, for other candidates. Patrick’s supporters opened a federal political action committee through which he can also assist candidates. Although always a practitioner of the more aspirational side of politics, questions Patrick posed to Kerry could be advice for himself as much as Americans generally. Kerry didn’t answer directly, but urged a recommitment to do what was right. He noted his decision to not pursue legal action in Ohio amid alleged voting chicanery in 2004. Likewise, Al Gore accepted the Supreme Court ruling—judicial and seemingly partisan fiat though it was, Kerry said. He told Patrick it was the most difficult political decision of his career. Kerry was blunter in his conversation with former Obama staffers and current podcasters Jon Favreau and Tommy Vietor. Speaking on Pod Save the World, the globally-minded sister podcast to better-known Pod Save America, Kerry said Democrats must call out the cravenness and hypocrisy of Republicans. Vietor asked how today’s Dems could counter the onslaught of lies and dishonest invective that Donald Trump and his minions launch. The question came in the context of Kerry’s own experience when his war record slanderously distorted in a process now known as swift-boating. “You got to answer it in every forum that it is,” Kerry said of such coordinated, defamatory efforts. Kerry explained how his campaign settled on taking the victory in the press—which largely discredited the attacks—and moved on. But the onslaught continued. In retrospect, he should have halted the campaign and addressed the issue head-on as Obama had done with Jeremiah Wright. 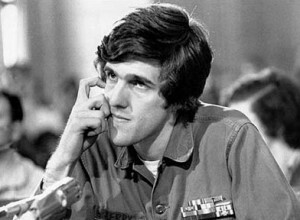 Speaking to both Favreau and Vietor and to Patrick in Boston, Kerry stressed the need to call out this behavior. He said, frankly, Democrats through the Obama years failed to highlight how Mitch McConnell has conducted himself as Republicans’ Senate leader. However, Kerry traced the all-or-nothing phenomenon to former House Speaker Newt Gingrich. “It’s not the rules, it’s the people,” Kerry said in Boston. Kerry also spoke at great length about his friendship with John McCain, who died last month. The two had worked together to help track down reports of missing prisoners of war in Vietnam. The former secretary of state recounted the extreme lengths and almost surreal details of the process of tracking down leads. With former Senator Bob Smith, Kerry even explored the innards of the temple where Ho Chi Minh’s body lies on display. It took some doing, but Vietnamese officials, committed to resolving tension from the war agreed. Although Kerry repeated the same themes in other interviews, the talk was itself extraordinary. Years removed from his presidential campaign—and politics generally—and almost two from the State Department, Kerry was candid and loose. His sense of humor, uninhibited by handlers and press was apparent. “My mother, she was the true public citizen,” he said at one point at an unironic moment. However, there were plenty of heavier, personal moment, even apart from Vietnam. In response to Patrick’s questions about faith, Kerry confessed to praying a lot as a lonely boarding school student. Faith was complex in his family. His Catholicism differed from his mother’s Protestantism. He came back from Vietnam “angry and agnostic.” However, after rereading the Scriptures and philosophy, he ultimately latched onto the idea of salvific suffering. A transitory, if vague interest of getting back into the arena himself permeates events like this. At the same time, Kerry seems just as interested in the future, if not necessarily his. For example, even as he praised Mike Capuano’s service, Kerry was immensely proud of Ayanna Pressley, his former aide, who defeated Capuano days before. These events are clearly designed to sell books, but Kerry has pressed the importance of the midterm elections this November at all of them. He clearly feels a responsibility to speak up. “You can’t retire with a country in the dire straits that we’re in,” he said. Patrick, the man sitting next to him on stage may be thinking the same thing.